This Cabernet Franc didn’t age long in our possession at all–we bought this bottle just about a week ago while tasting along the western shore of Seneca Lake in central New York. Four Chimneys, an organic winery that takes care to ensure no synthetics or pesticides are introduced to their grapes, conducts their tastings from a simple barn that overlooks this one of the Finger Lakes. 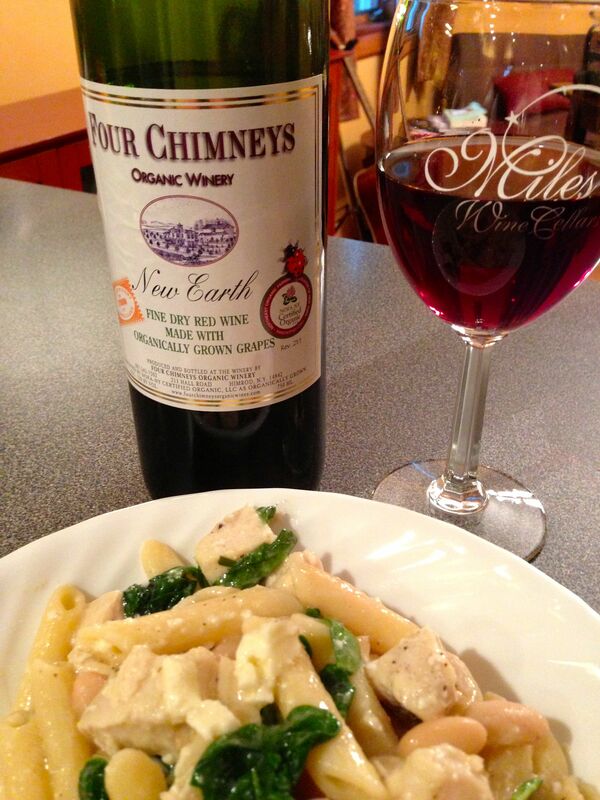 2009 Four Chimneys New Earth Cabernet Franc, Seneca Lake, NY, USA. As depicted here, our New Earth accompanied a pasta-chicken-feta cheese dish on the first night it was open. You might think a white better suited; I can tell you the Earth doesn’t overpower and was fine. I had it again last night with some tacos, and it really did well mixed with the spices. Tonight I even had enough left for a last glass after work. I got my fix here–a mild red, and good memories of a fun family weekend in the Finger Lakes–but I’m sated for now and ready for something else next time. This entry was posted in Cabernet Franc and tagged seneca lake, USA.